Svekolnik, Cold Borsht, Hlodnik, Holodnik, Beetroot Okroshka etc., this summer soup has quite a few names and many variations all over Eastern Europe. The common denominator for all those diverse recipes is a combination of cooked or raw beets, raw cucumbers, and a sweet and sour taste of the soup that is achieved by the addition of lemon juice, vinegar and sugar. 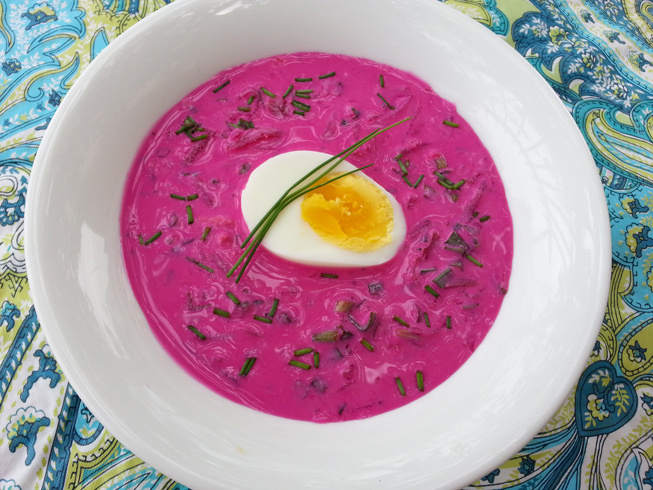 This version of the soup is a kefir or buttermilk based with lemon juice, roasted beets, raw cucumber, scallions, garlic greens, herbs and hard boiled eggs. 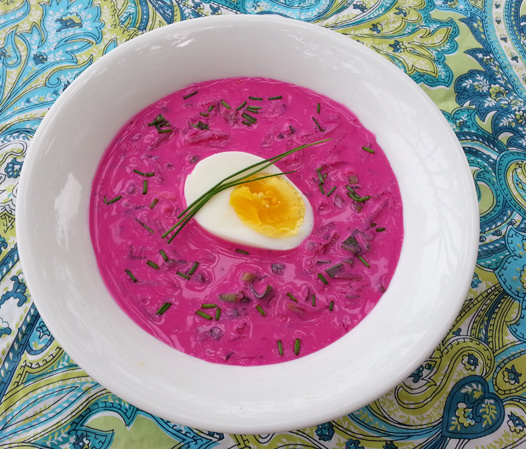 The roasted beet provides depth, flavor and the necessary sweetness just enough to omit extra sugar, kefir and lemon juice add the tartness, and we could stop at this point, but scallions, garlic fronds and hard boiled eggs transform svekolnik into a meal. You could also add boiled potatoes and raw radishes. I didn’t add potatoes, to limit the carbs(roasted beet is loaded with natural sugars), and the taste of radishes is a bit harsh for my liking in this delicate version. 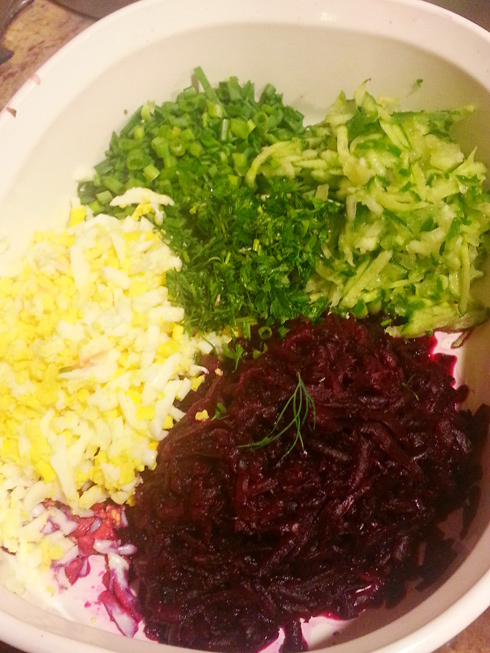 Grate the beet, eggs, cucumbers and combine in a dish with herbs, and lemon juice. 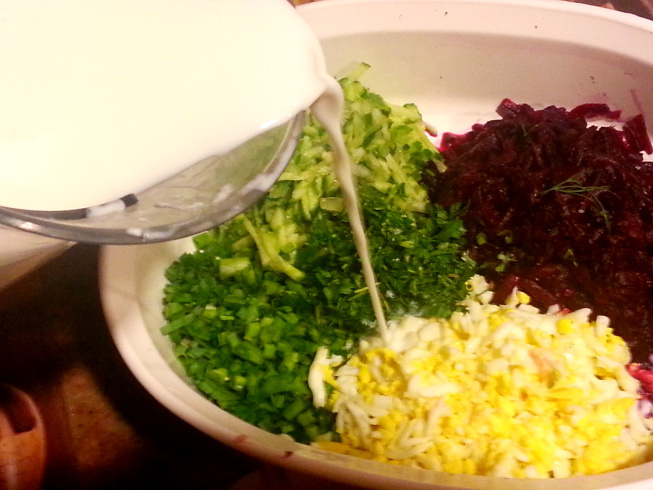 Mix kefir with water and adtad to the vegetables. Done. I recomend to let stand ovenight in regrigerator for a deeper flavor to develop.